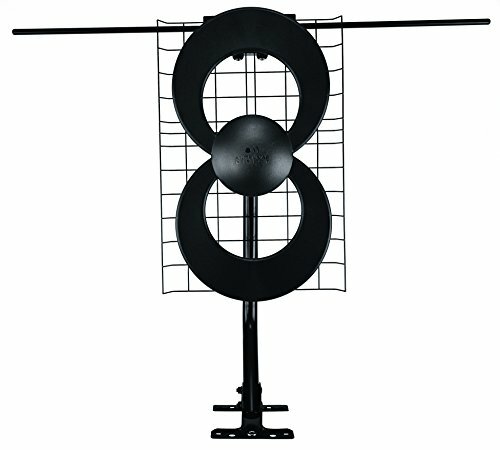 Are you looking for a HD antenna that can cut through heavy foliage outdoors or that you can put in the attic? The ClearStream 2V is something you definitely should look at. It’s quoted as a 70 mile category range. The price on the Clearstream is right, the technology in it is brilliant making it small in size and it can be used indoors or outdoors. When you are cutting the cord it can be so damn frustrating putting all the pieces together to make it all work together. Two of the most important pieces are a solid dvr unit and more importantly is the HD antenna and it’s range. So, I went out and tried several of these and decided to write about the ones that actually did work which is this one here. Now, let’s review the clearstream 2v below and find out the mileage, benefits, how to install it and if it can work for you. Note: Please keep in mind your location is extremely important when picking an antenna, along with any obstructions and building materials that can affect the reception if you are inside. It’s pretty straight forward. You get the antenna itself, which is 20″ x 12″ (35″ with raised dipoles). There is assembly required. It was a piece of cake. It took me 10-15 minutes tops and I was out installing it. It does include a 20″ j-mount pole that is coated to work in all weather conditions. It DOES NOT include a coax cable. Not a big deal, most of you will have it lying around or you can buy it for a cheap price. I bought my 21 foot coax cable from a local hardware store for $21. You can get it cheaper than that online but I was in a hurry. As stated this is a 60 miler. Antenna direct has been a leading manufacture in this area for many years now. They came up with what is called tapered Loop technology. It was one of it’s first design in the DTV spectrum. They came up with the circular pieces that you see in the picture to get the same reception of out dated legacy antennas. They also included a diplexer. This allow them to conquer the issue of combining UHF and VHF on the same antenna. No other antenna in it’s category can rival it’s compact design or power. You have a few choices here. If your tv has a clear line of site to a window in the direction of the tv towers you can put it right next to the TV. I am very specific about this because I tested it. I had it hung off my Tivo Roamio Dvr just to test it at first. I received a few channels inside right away that were clear as a bell. One of the kids walked in front of it and stood there and bam, the signal was distorted. So, you will need to keep it up in the air a bit to avoid anyone or thing blocking. My walls are so think in my house that this was not an option to keep it inside. Your next option is to install it in the attic. This is a great option for many as the j-mount is easy to install onto a 2×4. You will benefit from it being up so high but you will lose a bit of power because it’s in the attic. The last option is to install it on the roof or on the side of the house. For me I opted to install it on the side of the house just next to the roof line. It was an easy decision for me because the tv towers were in a direction I needed to shoot over houses and tree lines. My towers were roughly 32 miles away, so this was just perfect. You can purchase it here for the best price on Amazon for a cheap disount. Where to point it? I thought I should cover this quick. This is not bidirectional. I would start by pointing it at the station that is the closest to you first. Once that is dialed in, next go to the next station you want. From there try to find a balance of pointing the antenna in middle of the two where you get the best signal. First and foremost take some of these you read about any hd antenna with a grain of salt. If you are expecting a little antenna to break through a ton of trees 60-70 miles away then you need to be realistic. Line of site to the towers is everything when picking it out. For me personally I liked this version. It was super easy to setup and install. It is very compact which is great because it was not an eye store to install outside of the house. I love the comment about a couple who have a retreat home in the cabins. They get the channels they need and recommended it friends with the same success. They and a few others did not recommend installing a pre-amp with it. One had a 50 foot and another had a 100 foot run of rg6 coax cable. They actually said it made it worse by using it. Ok, before I release this article, I had to add my personal experience with it. I took the 6 year old out with me so he could hold the ladder while I held the antenna up and down the later. While I was doing that the wife was yelling out the window what my signal strength was. I can imagine what the neighbors thought. 🙂 With my Tivo Roamio I have an option to see the signal strength, so as I moved it in different positions, I had the wife yell out the signal strength. After 60 minutes of this and getting on the roof, I ended the night leaving it in the bush! Yep, a bush. I was able to get 60-67 strength on the room and 45-55 literally laying in the busy pointing in the right direction. Needless to say I’m going to mount this on a metal stand and call it good. My towers are 32-35 miles away. So, it’s working awesome! I made my first recording of Arrow on CW tonight with it in just a nick of time. It was a great buy for the price and actually worked! Overall I really like this antenna and definitely recommend it. It’s definitely in the lower price range, packs a lot of power for something so small, easy to install and worth a shot to see if it works for you. You can find the best discounted price for it here on amazon and read more customer reviews about how it worked for them as well. If you have any questions please comment below or contact me.